How your camera works– the meter | Stop Shooting Auto! This is part two of how your camera works, and it’s a little bit more complicated than the first round. I’ll try to keep it as simple as possible, but some of this is pretty close to magic. As I explained earlier, when you take a picture the aperture closes down part of the way, the shutter opens, and then the sensor records the light it saw. There’s a step that happens before that, and it’s a very important one. Your camera is surprisingly smart for such a small piece of gear, and it does a lot of sneaky stuff when you aren’t looking. You’ve probably noticed that if you leave the camera in automatic mode, it pretty much just figures out how to take a picture that looks pretty good. Sometimes it guesses wrong, but most of the time it gets pretty close to a good picture. How does that happen? Your camera has a built-in light meter that measures how much light is coming into the camera. Just before you take a picture, when the shutter button is halfway down, the camera very quickly measures the light coming into the camera and then picks out the settings it thinks will be best for a good picture. If you’re in a dark bar, the camera will want the lens to be wide open and the shutter to be open for a long time. In bright daylight, the camera will want a smaller opening and a quick shutter speed so that the photo doesn’t get overexposed. I’m sure you’ve seen the weird scale thing somewhere on your camera. There’s almost certainly one in your viewfinder, and quite possibly also one on a screen on the top or back of your camera. It usually has numbers that go from -2 to +2, with a bunch of tick marks in between and a line that moves around seemingly of its own volition. 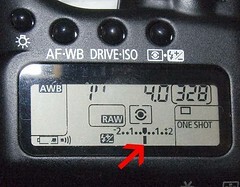 That thing is a display of your camera’s meter, and it’s really very simple to understand. The camera moves the line around to let you know if it thinks the shot is going to be underexposed, overexposed, or just right. When the line is right smack dab in the center, as it is in this photo, the camera is very happy about the exposure. That doesn’t mean the exposure will be perfect– cameras are far from perfect at guessing this stuff. They’re pretty good, though, and the camera’s meter will usually be a very good starting point. If the line is to the right of center, that means the camera thinks that the shot will be over exposed– the photo will have too much light. A much more common situation is that the line will be way over on the far left, which means that there’s not enough light and the photo will be underexposed. In automatic modes, the camera will do its very best to get that line in the middle of the display, but sometimes it just won’t be able to even at the slowest shutter speed and the widest aperture. Later we’ll talk about ways of handling that. For now, just try to get more light if you can. Modern cameras generally have very sophisticated meters with all sorts of different modes. You’ll often hear terms like spot, zone, center-weighted, evaluative, partial, super duper, whizbang, and confusing. Camera review sites will list the various modes as badges of honor, and gear geeks will discuss them ad nauseum. Don’t worry about those for now, and just leave yours set to whatever the camera’s default is. Right now, all you really need to know about metering is that your camera knows how to measure light and pick out shutter speeds and apertures based on the light it sees. OK, I’ll tell you just a little bit more. Your camera’s default mode is probably one where the middle of the picture matters a lot, the edges barely matter at all, and the stuff in-between matters a little bit. That’s because most people put the important stuff in the middle of the picture. Somewhere down the line we’ll talk about different metering modes and why you might care, but that’s pretty far away. It’s entirely possible that you’ll never have a reason to use anything but the camera’s default mode. I have just found your blog. And I’ve started to read it from the beginning as you suggested. Wow..you should be a teacher! You explain technical details I’ve been trying for days to understand in a language I can actually begin to start understanding! Thank you so much for taking the time to help beginners such as I! That is absolutely and precisely my goal. I’m glad I can help! I hope you can help me! I just found your site and it is fantastic. You have such an awesome way of explaining things! I have a new canon rebel t3i and have been trying to figure out how to use the light metering scale. Whenever I take a picture the little mark is always on the “0” unless I move it myself . . . “exposure compensation”. The little mark doesn’t move “seemingly of its own volition” to show me what the camera “thinks”. It would be soooo helpful if it did that! Am I doing something wrong? What mode do you have the camera in? Unless it’s M, the camera is going to adjust the aperture or shutter speed to compensate for changes that you make in other variables. Okay thanks! So what I was expecting to happen on the meter in Av and Tv only happens in M. I need to continue to practice with my camera and become more familiar with how each of those variables affects the others. I get frustrated with indoor pictures of the grandkids because so often they are underexposed or I get a blurred body part from movement. I often resort to the sports mode and let the camera deal with it, but I really want to learn how to avoid doing that:) There’s a whole lot of learning to do going from a point and shoot to a DSLR . . . .